At Troubadour she still had a gentle mix of her softer songs like Can't help Falling In Love, Can't find My Way Home, Last Kiss Goodbye, Sunny Afternoon, Let's Start, The Letter, Oops...and that soft side endears me deeper than the rock side so I appreciated that she hasn't gone full out heavy but can still enjoy her also being a Rocker. I have no idea who you are but if you are Opening for Steven, you gotta be good. I’ll go listen to you now. I know she is bringing Jay Michaels and probably the same band she had at the Troubadour as it doesn't look like Midnight will be doing backup. Harry is at a gig with Peter Quinn Saturday, and although Patti & Angie will be there, I doubt if they will be on stage. I think Tom, Greg & Kent would have posted something if they were being backup for Haley. It's ironic that Radiohead will be performing their original "Creep" at the United Center in Chicago the same night that Haley Reinhart will be performing it only 30 miles away in Naperville. The ticket scan on my phone worked (thank goodness!) and I headed to the Main Stage. 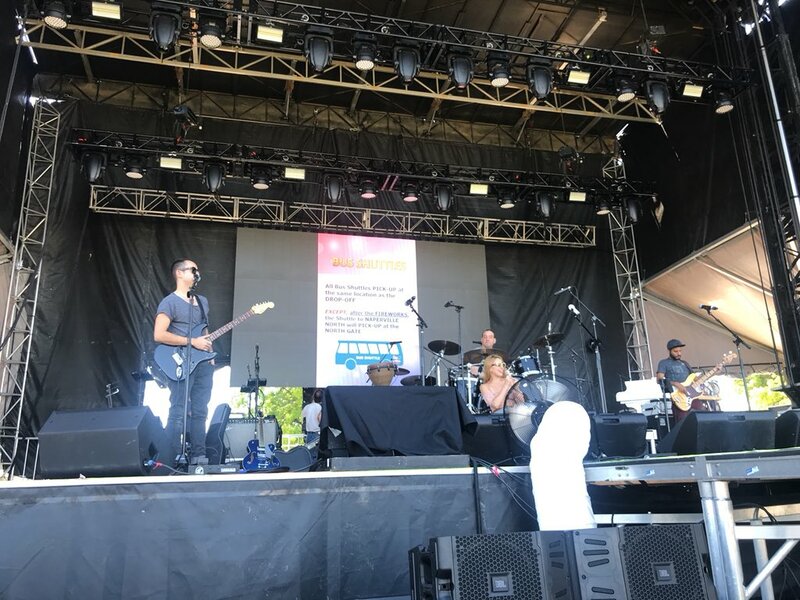 It was a pretty long trek from where I entered, so I checked out Haley's Instagram, she just posted that she was ready to start Sound Check. I hurried my pace, I could see her on stage. I passed through security and waved to Jay and Haley. "They let you guys in already?" Asked Jay, "I guess so" I called back... Haley had a big smile "Tusk! I didn't know you were coming...."
Haley mic checked 6-7 songs? I didn't record more than two... *enjoy yourself..you don't have to video everything* I brought 3 battery chargers w/ me. My iPhone battery is starting to lose power quickly. If I wanted to get video of the show, I needed to conserve power, memory space on my iPhone. It was only 1pm or so and the first act wouldn't be coming on until sixish, so we settled in. There were maybe 15 other people there with me, so we started chatting about what we were excited about. Most there were obviously there for Tyler, although a young couple knew Haley and her Idol season. 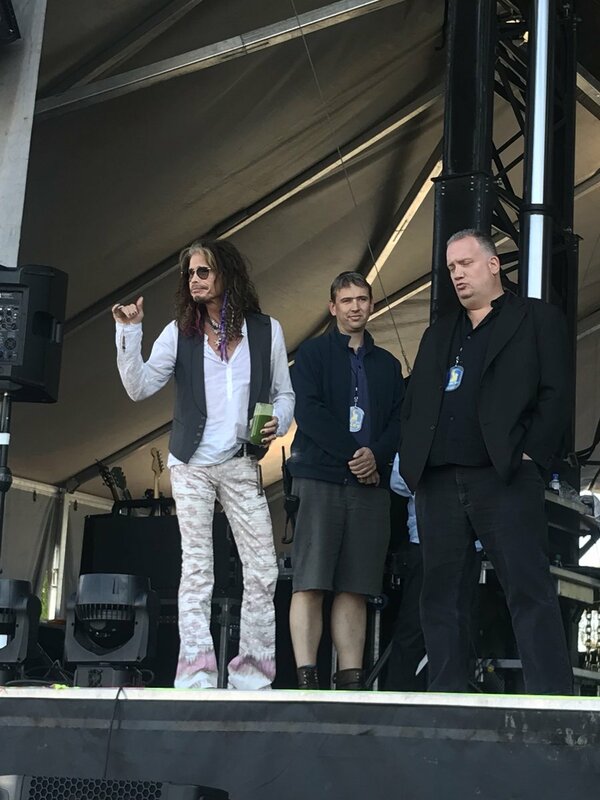 I showed them some of my videos from my channel, Steven Tyler was amazing, but I was there to see Haley, I showed them why . It was a great time talking about who we've seen, my last time seeing Tyler, I might have been 19/20 years old and stupidly chugged three "Mickey's" Green beer bottles w/ Vodka, Rum and Tequila in each. When we realised we couldn't get them pass security, my two friends and I thought of the 'bright' idea of chugging and passing each bottle until they were empty....yes, young and stupid was an apt description. I don't remember much about that Aerosmith/Judas Priest show because I was too busy vomiting... the stage looked like a broken TV where everything was scrolling up . Greg knew before hand that he needed those in the section to not get upset at him when he moved into their areas for his photo. Instead, they were pleased to see him come, talked about what he was doing, he was now part of the experience. Why do I bring this up, completely unconnected to Haley and Steven Tyler? I made friends w/ everyone around me. 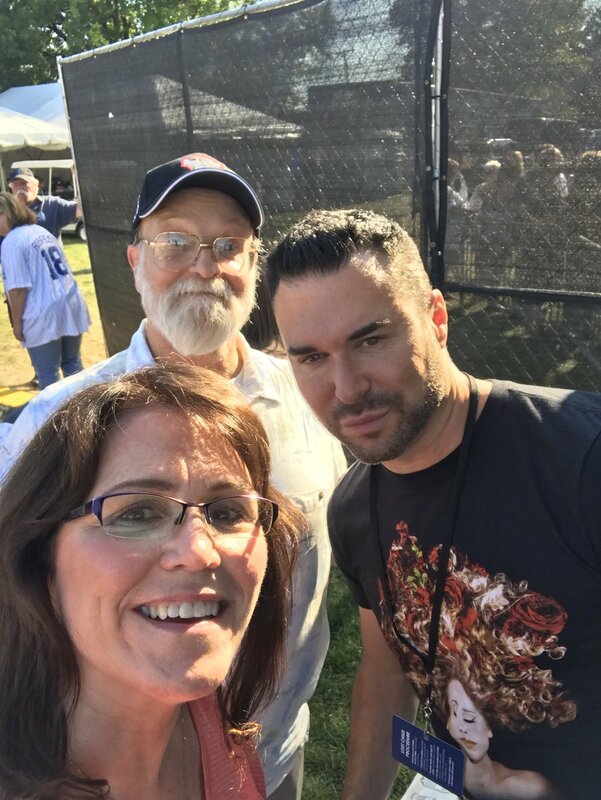 There was Al and Tricia, blogger and photographer, really nice couple, she's loved Tyler for years, this is her first time seeing him Live. There was Greg, Donna etc.... why was this important, why did this executing of what I observed Greg do make a difference? As we were waiting, Jay texted me that they decided to make a Meet and Greet and gave me the details to tweet out. 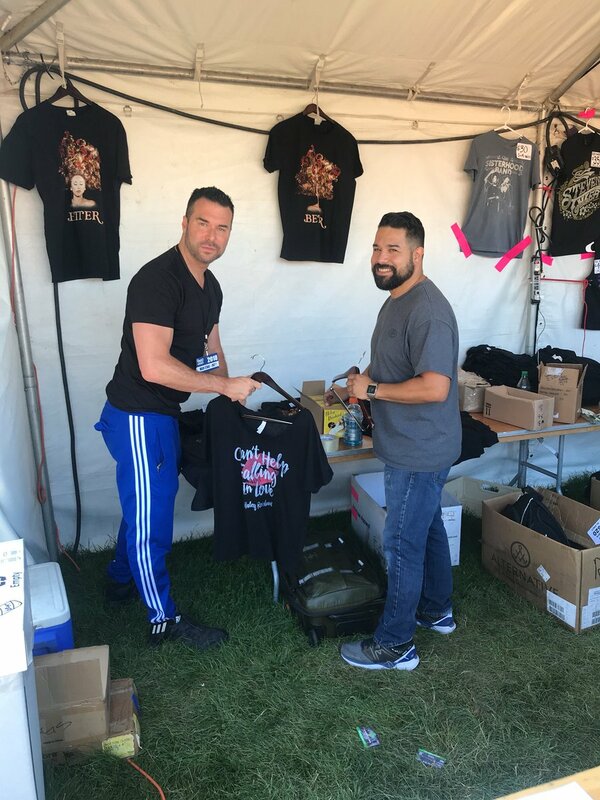 Rich (Haley's tour manager on all 3 of her recent tours) and Jay were setting up the merch booth, I went and bought my new friends beers ($7 a piece is actually a bargain at these kinds of things) and headed to see them at the Merch Table. I wanted to discuss what's to be done w/ my Channel while I could talk to him face to face instead of over text. 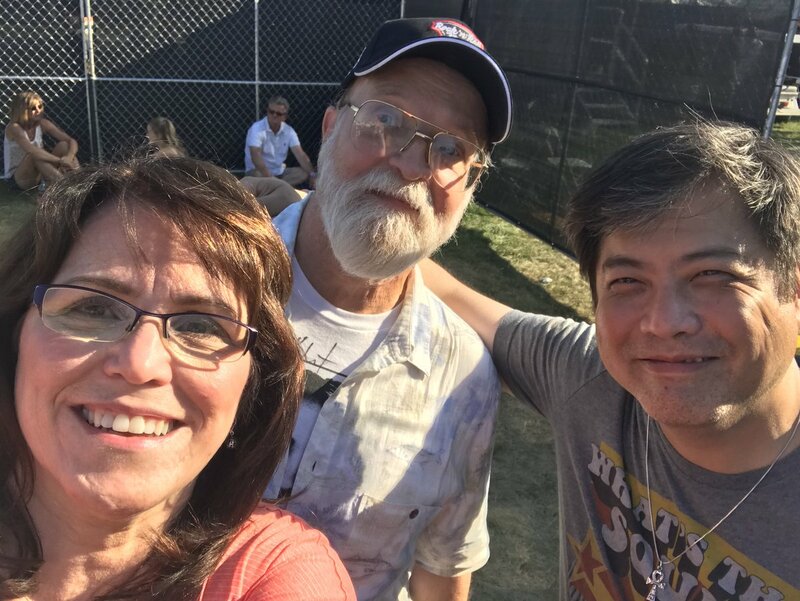 On the way to talking to Jay at the booth, I met up w/ Babbs and her daughter, that's when she told me that Steve won VIP access to the VIP section, "free" food and non alcoholic drinks. I also met up w/ Grandpa Fred, a long time friend of the Reinharts who I've met several times over the years. He gave me a hug, I didn't expect (I promised him a Blu Ray to Haley's Troubadour show and sent him discs for the BGDays and Idyllwild "Movies") He was confused why he couldn't get into what he had purchased for. He showed me his receipt, it said he paid $300 for VIP yet they gave him a 'general admission' ($50 worth) so I talked to some officials of the venue, eventually, we got it straightened out and Fred got his full access bands. While there, I heard that Patti, Angie and family were having problems getting their tickets. Jay went to figure things out, since I was already there, I figured, I'd hang out, say Hi to Patti and Angie. Babbs, her daughter and Steve joined us. They got there a couple hours before the show, but I texted Babbs about the Meet and Greet, so they knew where to go. Another young couple from Ohio also signed up, the young man w/ Haley's mugshot T-Shirt. I had given him the "HALEY" yell of solidarity earlier lol. So when I found out about the Meet and Greet, I told them about it. I returned back to my area in front of the stage, to see if it was still mine, and sure enough, they had kept their word. I told them I'd be back, the Meet and Greet was about to start. On the Meet and Greet sign up sheet, there was six? Seven names? I think Jay had said they prepared for 50. Tyler's Meet and Greet fans were still out near the merch booth. Their meet and Greet had started late. There was a bit of concern Haley wouldn't get her time for her M&G. The two female act before Haley included a daughter of Rod Stewart (more on this later) They were pretty good, the other gal was country, Rod's daughter was more rock. They had just signed to a label and had fans there, "The Sisterhood Band"
The disclaimer is to explain why I ended up leaving my spot at the front row before Tyler came on. I had what I came for, and more. Haley was spectacular, there was an unexpected Meet and Greet, got to see the Reinharts, all the boxes were checked. Also, behind me, there was this young kid, I think he had down syndrome, his name was Anthony, I fist bumped him on his name. Apparently he made some kind of impression at the Ribfest, previously, somehow got on stage w/ an act and was a hit. The video showing this had apparently gained over a million views. Some of the set up people on stage knew him. The security behind the fence we were standing in front of him knew him, gave him high fives, he was getting alot of love. I tried to lean a certain way so he could see, as he was shorter than me. He was so in the moment, he couldn't help but sing when Haley tried to get the crowd involved on Let's Start and Expensive Taste. He was yelling "I Love You" and "What a voice!" At any other show, I might have started tensing up, will my mics pick him up?...he was singing off key and loud, but with so much joy and enthusiasm. BUT, I had, at this point, framed my mind that I was there to have a good time, and this included w/ the fans around me. I was able to relax and enjoy the moment. What my phone picks up, it picks up. Even if I get perfect audio, there's no guarantee they'll ever be posted, they'd have to be cleared through #TeamHaley. This changed mind set, something I conditioned myself to think from the beginning of the day, allowed me to relax and not worry, enjoy the show. These people were here to have fun and the young man, Anthony, was having a blast. I could not be upset at that, the day was perfect, light breeze and everyone was enjoying themselves. So these two things factored into my decision to leave my spot. I gave it to Anthony, he looked shocked at me "are you sure?" yes, I'm sure, have a great time! 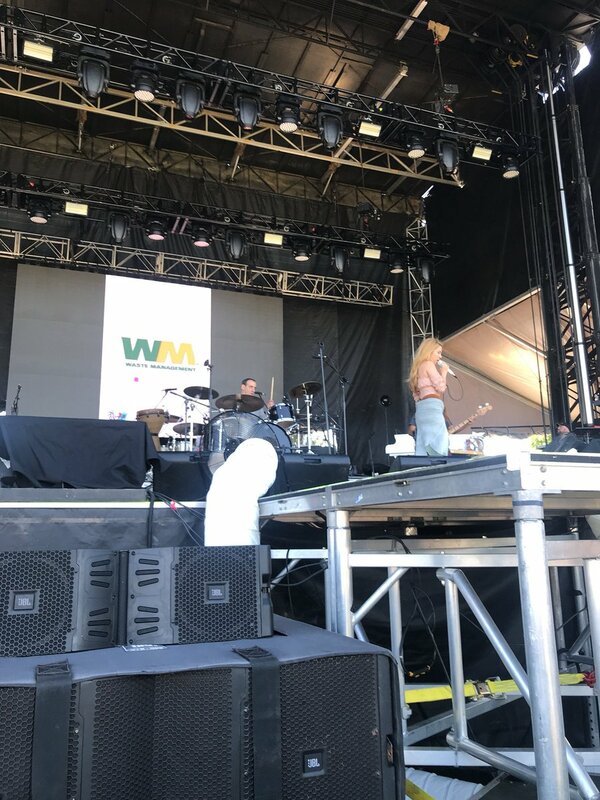 I thanked Al and Tricia keeping my spot, told Tricia to enjoy the "Fnck" out of her first time seeing Tyler live, to which she gave me an exuberant "Wooooooo!". 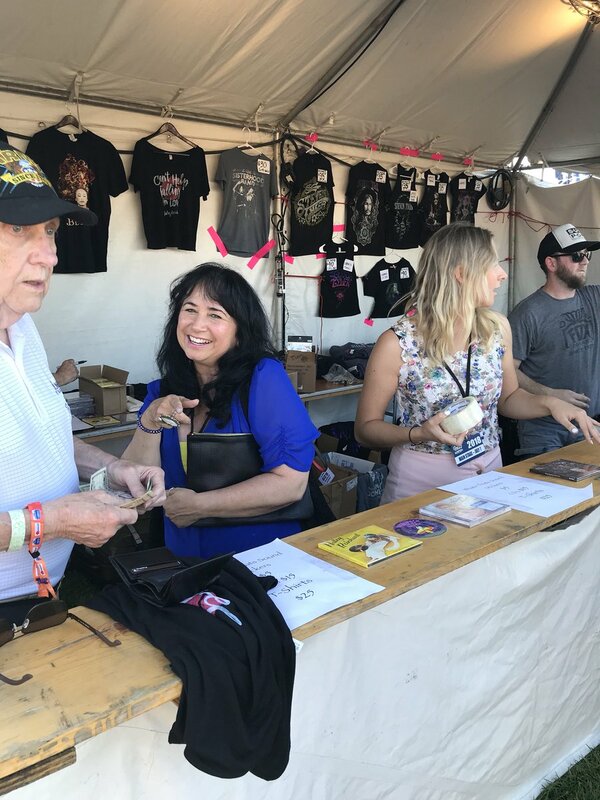 Said my goodbyes to the others and headed to the merch booth. 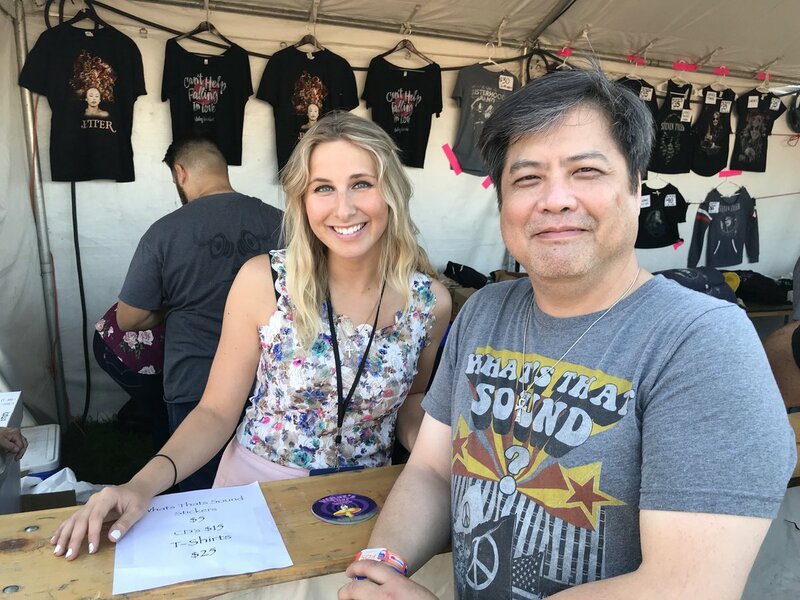 At the Merch Booth, I got to talk a little more w/ Rich, the tour manager. I told him that Haley had told me (in Idyllwild) that they might've recorded the audio to Haley's Better tour, Lincoln Hall show. I told him he should look at Babbs' and my videos, especially Babbs. It was my opinion that it was one of the best shows that we video'd and that IF this board audio existed, we'd gladly give them our video from Lincoln Hall to use with the board audio (if it existed)....Rich revealed to me something they're considering doing at Haley's shows into the future (I had mentioned the Troubadour audio in context of sound board audio). At the booth, a couple other Reinhart friends offered to take over the booth for Patti. Angie had to leave after seeing a couple Tyler performances, because she had a gig to go to. So w/ someone watching the booth, I accompanied Patti to go watch Tyler. She didn't understand why I wasn't already doing that lol. Earlier, I learned that Harry WAS going to try and get to the show. Rich and family friend Bill, were trying to give him directions, which entrance, to get his access. He was still 40 minutes or so away. 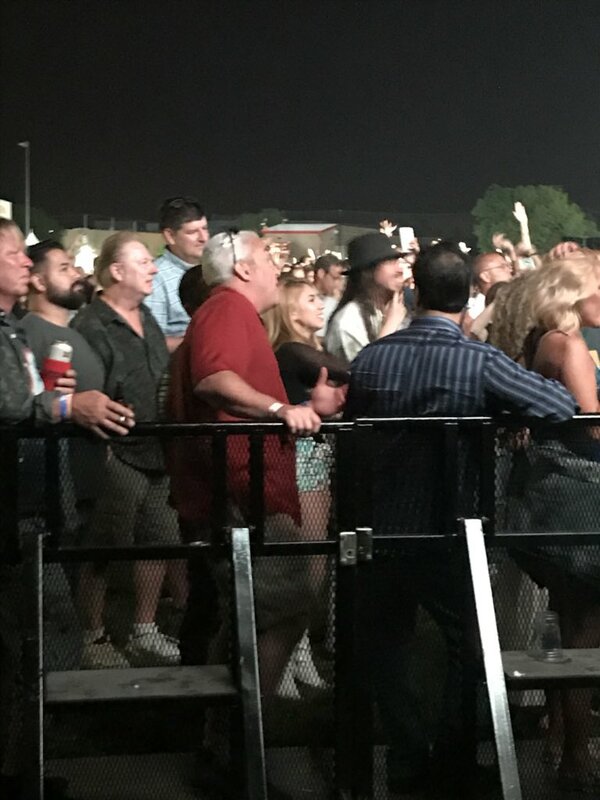 I told Patti after returning from watching a couple Tyler songs (the only one I recorded was his Beatles medley, in hopes he might bring Haley in on Oh Darlin'), that I would wait with her. I wanted to say Hi to Harry. As things wound down, they began packing up the Merch, I had made friends w/ another Reinhart friend, I hadn't met before. Harry had arrived and was w/ Haley, but behind the gate that led to back stage where we took out meet and greet pictures. I needed a special pass. The Reinhart friend, I think it was "Rick", told me to grab some things, and follow him. He nodded to security that I was w/ him, I was helping him load up their stuff....I was in the back... . We went to the dressing room to drop of the stuff. Harry and Haley was supposed to be there. I followed another Reinhart relatives (too many names to remember! I've run out of storage space!) to go out and look for them. Eventually, we found them. Haley, Harry and the band went out to the front. 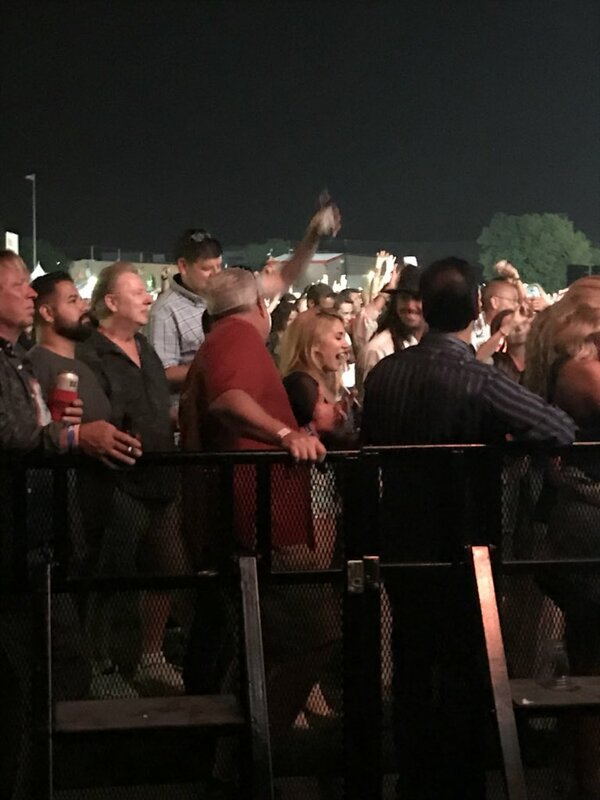 Harry had got there in time to catch Tyler's encore, a medley of "Walk This Way" ending w/ Zep's "Whole Lotta Love".... they were having a ball, all with big smiles on their faces, laughing... I took a couple of pictures. 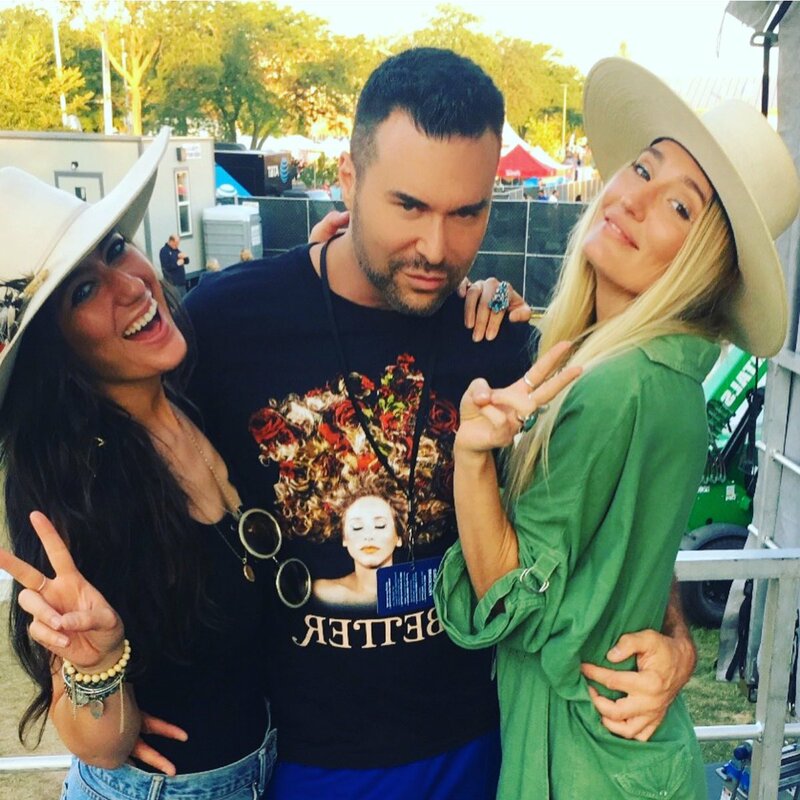 After the show was over, after Haley taking pictures w/ fans on her way back stage, after taking a band photo, Haley met up w/ the The Sisterhood Band, the one w/ Rod Stewart's daughter, they must've talked for like 15 minutes. I asked if I could take a pic with all three of them, took some for them on their phones. Haley and they exchanged digits, Haley told them to hit her up when in LA (future collaboration? They were pretty good, very good harmonies ). I took that time to talk to Dylan, got his info to send him video from the Troubadour since they may not get posted, especially "Lover Girl" where he had good video on his solo. 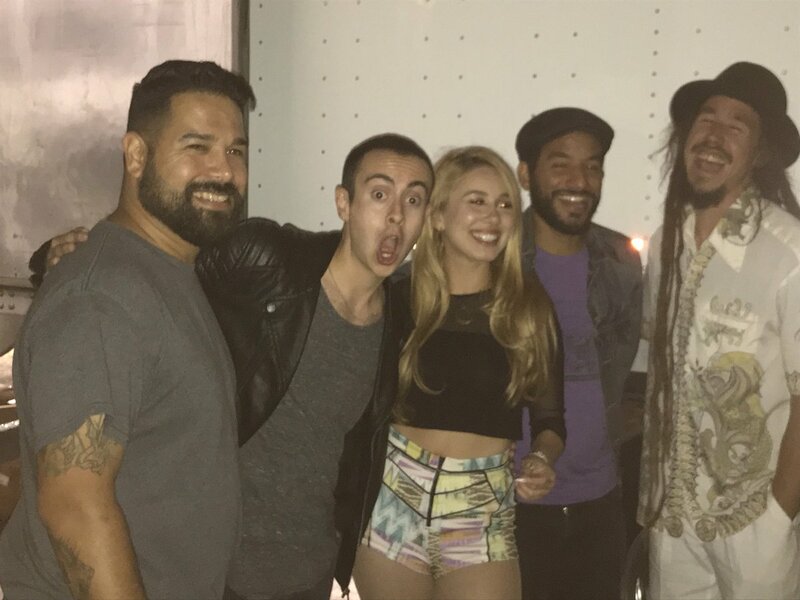 I talked to David Gorospe, the keyboardist who also played w/ Haley during the WTS tour. I told him I noticed the keyboards was unmanned at the sound check...what happened? He told me he had flight problems, and Just made it in time for the show. Several pictures were taken of different combinations, Tom Kro, Midnight's bass player, asked if he could take a photo w/ the Sisterhood Band and Haley, grinned and said he was in heaven when the picture was taken. I also talked to Harry some more. You could tell he was buzzing. He asked Haley, "Did you even get to spend some time w/ Steven?" Haley said, "Oh, yeah, we hung out"
Thanks for the detailed account. 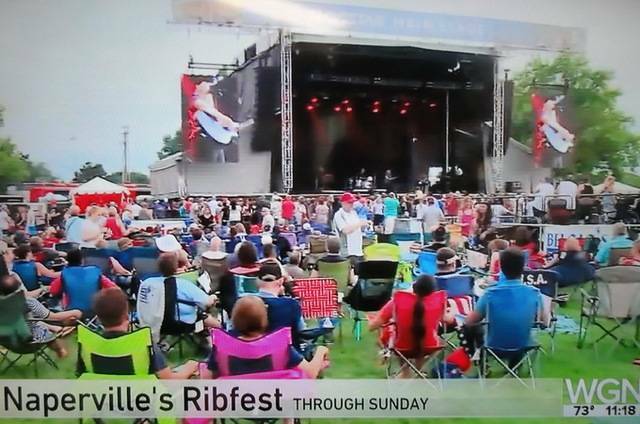 It seems the Troubadour was a shakedown show for Ribfest. I like that they're projecting Haley's name behind her... makes it easier to remember for anyone who comes away impressed. This was great exposure and I hope she gets the opportunity to appear before other big crowds. 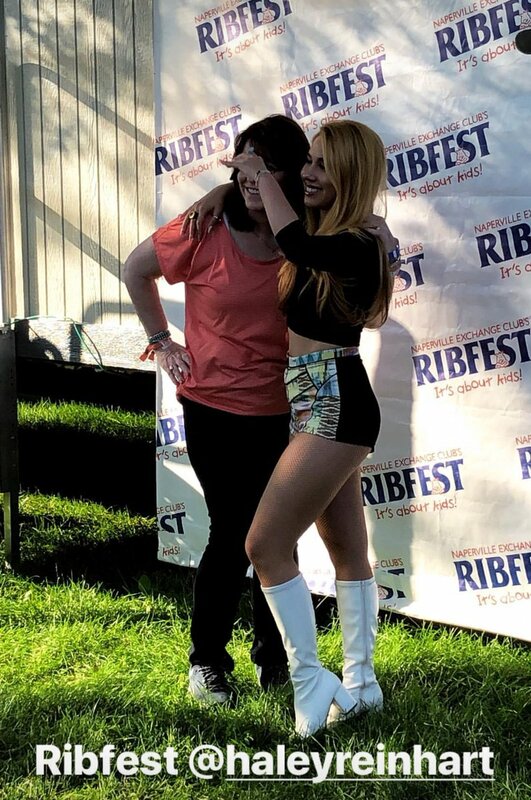 RibFest. 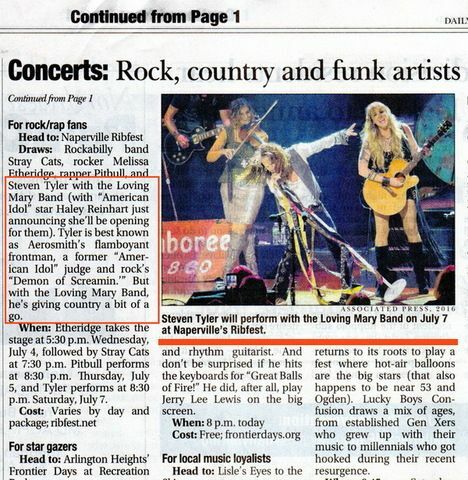 Opening for Steven Tyler with my friend of 6 years, Haley Reinhart. 30K people. Naperville, IL. I don’t even know what to say. I am just so grateful. I also did a guitar solo on the ground because I’m a cool adult. Joe Glogowski her and Casey Abrams have a few songs together. She’s amazing. She should have won idol that year. Quote: Christina Vlahos Sussman added a photo and a video. Where is this? When she was on AI she was all the rage in here hometown of Wheeling. She is one of my favorite singers! Quote: Christina Vlahos Sussman added a new video. Told you she was a good singer. Current time: 04-18-2019, 06:49 PM Powered By MyBB 1.8.19, © 2002-2019 MyBB Group.